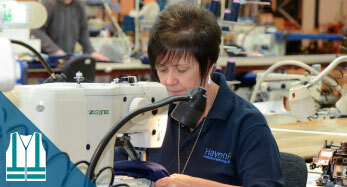 Haven PTS was formed in October 2013 following the political closure of the Remploy Textile factories in Scotland. Since formation Haven PTS has grown significantly and now employs over 50 skilled textile manufacturing staff of whom over 90% have some form of a disability or complex barrier to work. We have a unique ethos of supporting disabled people to build sustainable careers which we believe your organisation should be a part of. In return, you will receive a high quality competitive service and an opportunity to achieve your organisation’s Corporate Social Responsibility goals. Our vision is to provide customers with a high quality cost-effective UK sourced textile manufacturing solution at the same time as providing a sustainable employment and training environment for adults with a disability. PTS is constantly looking at opportunities to increase our product and service offering with a goal to create more opportunities for disabled adults to join our team. In addition, Haven PTS hope to increase the number of disabled young people within the workplace to provide long-term employment and training opportunities.